PRIMATES OF AFRICA – A Struggle for Existence. The Korck Publishing “Primates of Africa” poster could before too long become an historical reminder of how things were. 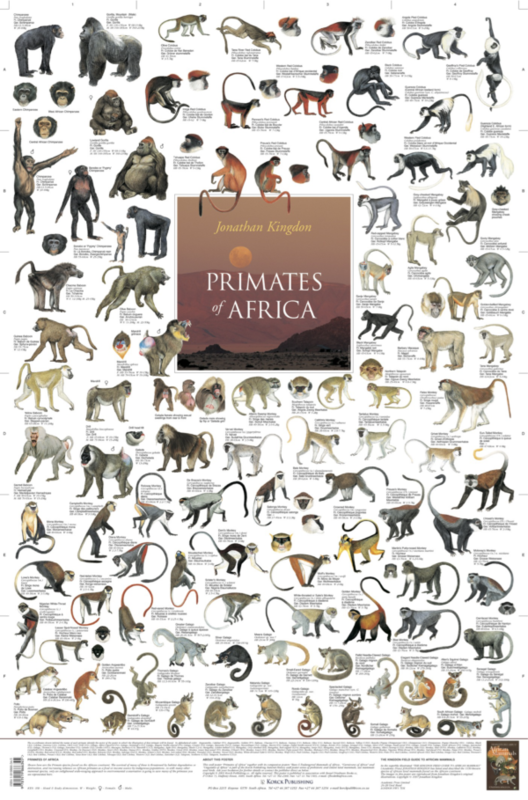 Illustrated on this poster are 88 species of Primates currently found on the African Continent. Tragically the survival of many of these species is threatened by habitat degradation or destruction, and increasing reliance on African primates as a food or income source by indigenous populations. As with many other mammal species, only an enlightened wide-ranging approach to environmental conservation is going to save many of the primates you see represented here. With the increase in popularity of eco-tourism some hopeful progress is being made in leading local populations to the realisation that the primates and other mammals with which they share their environment are worth more to them alive than dead. The vivid Primate illustrations are by Jonathan Kingdon.